Salvatore Ferragamo saffiano leather wallet. Flap front with Gancio flip lock clasp. Inside, four bill and seven card slots. ID window; one slip and one zip pocket. Salvatore Ferragamo smooth leather wallet. Flap top with snap closure. Quilted Gancio logo at center. Interior, leather lining. Five card slots; zip coin slot. 3.5"H x 5"W x 1"D. Made in Italy. Salvatore Ferragamo metallic leather wallet. Flap top with snap closure. Gancio logo at center front. Six card slots; one zip pocket. 3.5"H x 5"W x 1"D. Made in Italy. Salvatore Ferragamo metallic calf leather wallet. Zip-around top closure. Quilted Gancio front feature. Interior, center zip compartment. Two bill and eight card slots. 4"H x 7.5"W x 1"D. Made in Italy. 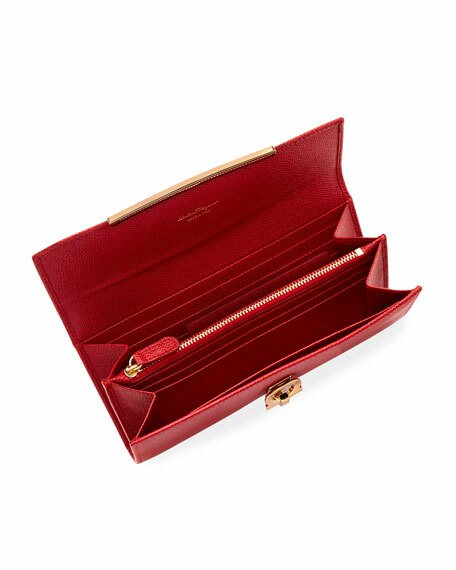 Salvatore Ferragamo calfskin leather wallet bag with golden hardware. Removable chain shoulder strap, 23" drop. Flap top with snap closure. 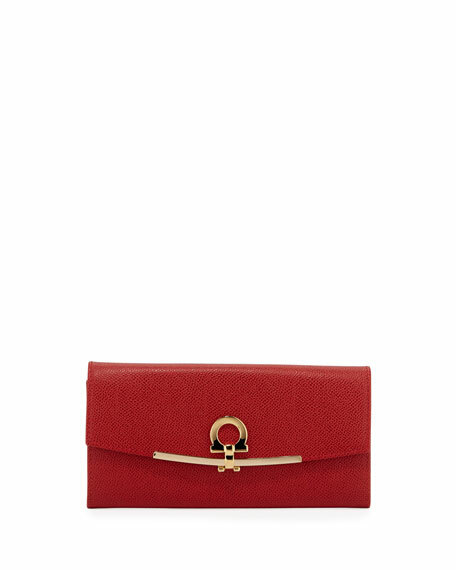 Salvatore Ferragamo calfskin leather wallet bag with golden hardware. Removable chain shoulder strap, 23" drop. Flap top with snap closure. Exterior, raised Gancio with engraved logo detail. Leather lining, three card slots. 3.5"H x 6.5"W x 1"D. Made in Italy.